The Palms House is the ideal pad for the married couple who actually gets along with their in-laws- but still wants a little privacy. 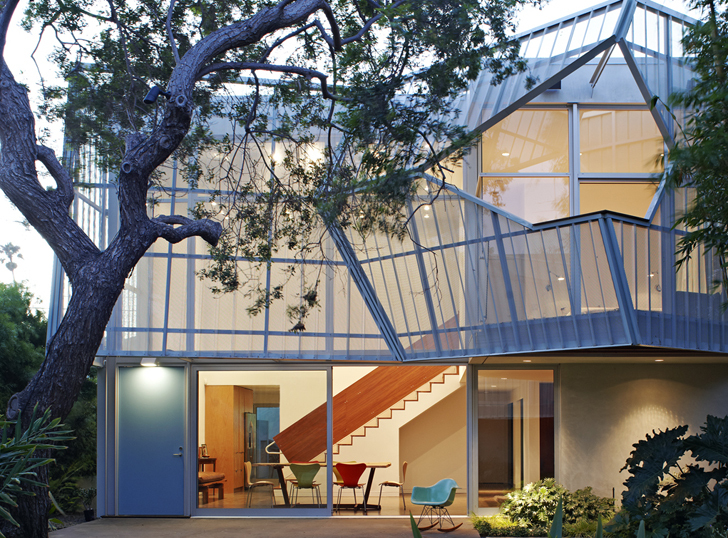 Designed by Daly Genik, the Venice, California home includes a primary residence and guest house, which surround a courtyard filled with greenery and trees. The architects gave the house a much needed update, expanding living space, adding a bedroom, and implementing solar paneling and other energy saving features. The original house was a large open loft with one bedroom. The guest apartment sits atop a garage at the front of the property (unlike most house/guest house set-ups). Daly Genik tackled and reorganized the space to better suit the new family, and their frequently visiting relatives. The overhaul expanded the main house from one to three bedrooms and three baths. An unused back room, adjacent to the kitchen, was opened up into an innovative outdoor dining area by removing the roof. Perforated metal skins were added in jutting geometric shapes to the façade of the main house and the apartment/garage. Angled and pointed into triangles, the skins are supported by aluminum frames, and almost reach toward each other, creating a relationship with the main and guest houses. Inside the angles, Daly Genik built odd shaped balconies that extend from the master bedroom and the apartment. The perforated metal also acts as a natural shade from the sun, and filters in natural lighting into both structures. The perforation creates a sense of privacy, but also allows the family members to see each other from their respective balconies. Each building is passively cooled by the metal perforations and cross breezes from the added balconies. The gardens and courtyard have been thickly planted with lush greenery to further cool the interiors. Solar panels were installed on the roof of the main house to collect solar power to heat the water for the buildings and for the radiant heat floor panels. Daly Genik’s overhaul created a housing complex that brings the family together, while allowing the main residence a bit of privacy when the in-laws come around. The original house was a large open loft, with one bedroom. The guest apartment sits atop a garage, at the front of the property (converse of most house-guest house set ups). Daly Genik tackled and reorganized the space to better suit the new family, and their often visiting relatives. The overhaul expanded the main house from one to three bedrooms, as well as three baths. An unused back room, adjacent to the kitchen, was opened up into an innovative outdoor dining area by removing the roof. Perforated metal skins were added in jutting geometrical shapes to the façade of the main house and the apartment/garage. 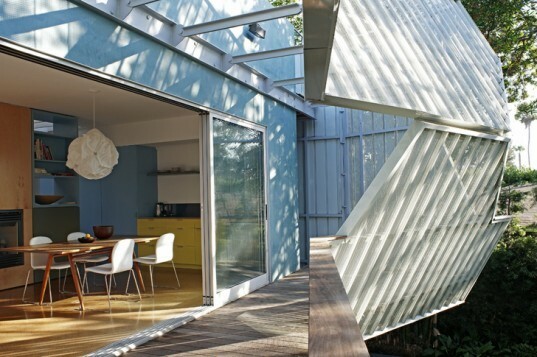 Angled and pointed into triangular shapes, the skins are supported by aluminum frames, and almost reach toward each other, creating a relationship with the main and guest houses. Inside the angles, Daly Genik built odd shaped balconies that extend from the master bedroom and the apartment. The perforated metal also acts as a natural shade from the sun, and filters in natural lighting into both structures. The perforation creates a sense of privacy, but also allows the family members to see each other from their respective balconies. Each building is passively cooled by the metal perforations, and cross breezes from the added balconies. The gardens and courtyard have been thickly planted with lush greenery to further cool the interiors. Solar panels were installed on the roof of the main house, and collect solar power to heat the water for the buildings, and for the radiant heat floor panels.